Col. Steven M. Shepro, USAF (l), 316th Wing/Joint Base Andrews commander, and Capt. Timothy Fox, USN, Naval Air Facility Washington commanding officer, unveil their joint team logo during a Joint Base ceremony. 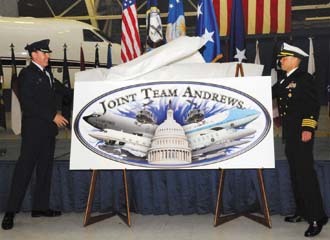 The event signified the unification of Andrews Air Force Base and Naval Air Facility Washington, and renamed the installation as Joint Base Andrews-Naval Air Facility Washington, Maryland. New multiservice bases expected to offer rewards after their setup challenges. Some U.S. troops are finding their home bases a little more diverse than in the past. Various posts around the country are transforming from geographically close but military-branch separate bases into single, larger, joint-service locations. This arrangement reflects the morphing of military missions to joint operations. It also saves the U.S. Defense Department needed funds while continuing to provide the same services to warfighters and their families. The joint bases offer the military services and the Office of the Secretary of Defense an opportunity to run joint installations in the United States in a similar manner to those operating in theater. “Additionally, the joint base is a testbed for joint installation standards and organizations, and another way for the services to learn from each other to improve their own operations both at home and abroad,” Col. Mickey Addison, USAF, the Defense Department’s deputy director for joint basing, explains. Installations identified for joint basing either share a common boundary or are in close proximity to one another. This provides the opportunity to consolidate the delivery of installation management and support functions. Defense Department installations, regardless of service affiliation, employ military, civilian and contractor personnel to execute these functions using similar processes. “The Defense Department will use this opportunity to create the conditions for more consistent and effective delivery of installation support,” Col. Addison says. Impetus for the consolidations came from the 2005 Defense Base Realignment and Closure Commission, commonly referred to as BRAC, report recommendation number 146, which calls for 26 bases to realign into 12 with a single military service branch assigned as the lead at each. By law, full implementation of that recommendation must be completed by September 15, 2011. The department should meet the requirement almost a year ahead of schedule. On October 1, 2009, the first joint installations reached full operational capability (FOC): Joint Base McGuire-Dix-Lakehurst, New Jersey; Joint Base Andrews-Naval Air Facility Washington, Maryland; Joint Base Myer-Henderson Hall, Virginia; Joint Expeditionary Base Little Creek-Fort Story, Virginia; and Joint Region Marianas, Guam. On October 1 of this year, seven more bases will achieve FOC. Those include Joint Base Lewis-McChord, Washington; Joint Base Anacostia-Bolling, Washington, D.C.; Joint Base Elmendorf-Richardson, Alaska; Joint Base Pearl Harbor-Hickam, Hawaii; Joint Base San Antonio, Texas; Joint Base Charleston, South Carolina; and Joint Base Langley-Eustis, Virginia. Most of the consolidation occurs between two installations run by two branches of the military, but there are exceptions. For example, McGuire-Dix-Lakehurst combined Air Force, Army and Navy facilities, making the installation the first tri-service base. Joint Base San Antonio will bring together two Air Force bases and one Army post. Planning and executing these major conversions requires involvement and leadership at various levels. Joint Base Partnership Councils handle the details such as personnel from the installations involved. Representatives from the higher headquarters of the bases form the Intermediate Command Summit to provide first-level oversight and support. The members help define the resources that need to be transferred. At the highest level, flag officers and senior civilians from the military departments and Office of the Secretary of Defense make up the Senior Joint Base Working Group. These leaders make policy decisions and manage the overall execution of the joint basing program. Implementation teams work with the groups to assess the organization, resources and staffing for providing installation support at each new joint base. Changes must accord with the new Common Output Level Standards (COLS) identified in the 2008 Deputy Secretary of Defense’s Joint Base Implementation Guidance (JBIG). The JBIG and follow-on supplemental guidance served as the framework for a memorandum of agreement for each base. The vice chief of staff for each service signed the agreements, which identified procedures and resources necessary to operate the joint base at the COLS levels. Resources then were transferred to the services in the fiscal year 2010 President’s Budget submittal to align resources with responsibility for installation support at the joint bases. The military departments are fully engaged in the process and direct the implementation of joint bases where they are designated as the lead installation support organization. The Office of the Secretary of Defense provides policy guidance and oversight for the process. BRAC recommendation number 146 also spells out the installation, lead service for each base and timeline for the joint-basing process. The Senior Joint Base Working Group decided the policy of joint base implementation phasing. It elected to begin the implementation process at smaller installations first and leverage the lessons learned during the merging of larger bases the following year. A joint service honor guard takes part in a Joint Base McGuire-Dix-Lakehurst, New Jersey, commander’s call on October 1, 2009. The commander’s call marked the inauguration of the first tri-service base in the United States. Each joint base has a commander and a deputy. The commander is always a member of the lead service for the installation; the deputy is from the supporting military branch. For example, at Joint Base McGuire-Dix-Lakehurst, the Air Force has the lead, the vice commander is in the Army, and the group commander is a naval officer. So far, the colonel says the effort has been successful and on schedule. “As with any new program, there have been lessons learned, but each joint base commander, the parent command and the joint team have found solutions and met the BRAC timeline,” he states. Col. Addison delineates the advantages of joint basing, including the ability for the military to develop joint standards for installations and enabling services to learn from each other. In addition, the military can achieve benchmarks and better practices for installation management. Across the country and still in transition, officials at Joint Base Lewis-McChord have positive comments as well. The joint base already has reached initial operational capability, and base leaders say the goal is to provide a seamless and transparent transition with all base services provided at the same or higher levels. The base has 267 services in 49 support areas that must be fully operational by October 1. Adding to the pressure is the return of 18,000 soldiers from Iraq over a three-month period this summer. One of the issues personnel involved with the new installations face is how to bridge services’ cultures and meeting the expectations of commanders and customers. Col. Addison says that “The services’ installation support organizations all do a superb job within their own service; the challenge is to form a joint team that consistently meets the joint standards [COLS] and meets the expectations of the commanders and communities they support.” Also challenging for personnel is maintaining the combat capability of both combat support forces embedded in installation support organizations as well as support to the missions assigned to each base. The colonel says this remains a priority. The most important thing the joint-base teams and leadership can do is to ensure they properly care for employees who are transitioning from one service to another, he adds. For example, civilians who worked on an Air Force base that has merged into a joint base under Army leadership must transfer from the Air Force to the Army. “Correctly managing the transition is vital, especially to the welfare of the employees who are changing service affiliation,” Col. Addison states. Where people will carry out their jobs depends on the installation and the job function. In some cases employees may move and co-locate, whereas in other situations personnel will stay put. Local commanders will make the decisions based on what they believe is best, just as they do at traditional installations. The transitions involve no reduction in force actions. However, personnel on the bases will be affected by other departmentwide personnel actions and decisions in the same way as employees on a traditional base. Military assignments are not affected by the conversions. Morale, welfare and recreation functions such as base bowling alleys and movie theaters are defined as common installation support functions, so responsibility for those programs transfers to the supporting or the lead service component of the bases. For issues such as child care, the same number of resources should be available at each location after the bases become joint as when they were separate. Because of the cultural differences among the military branches, leaders at the joint bases are working hard to communicate with the personnel on their installations through town hall meetings, newsletters, podcasts and newspaper articles. “If there’s a medium for communication, they’re using it,” the colonel shares. He says all the commanders are committed to ensuring that personnel making transitions are well taken care of and that the quality of services remains high. Though the concept of joint bases in the United States is new, the plan reflects how the military already operates. Troops work in joint environments and on joint missions every day both in the country and in forward operating locations. In current war zones, joint bases already have been established. Joint Base Balad in Iraq has been operating under the “joint base” moniker for several years. Col. Addison says that the troops in Iraq and Afghanistan who work in a joint environment will benefit from having a similar situation back home even if only on 12 installations. Within the United States, the change is not revolutionary either, because most installations already have multiple services represented in their personnel makeup. Though joint bases were recommended to combine efficiencies and services at geographically close installations, Col. Addison says the oft-used phrase “train as you fight” is a contributing factor. The concept might not be the purpose of melding the bases, he explains, but it certainly is a reason joint basing has been successful. For the communities surrounding the joint bases, business generally will continue as usual, though Col. Addison says the exact effects probably will vary on a case-by-case basis. Members of the community will deal with the same people as before the bases became joint, but they will have only one commander to work with instead of multiple commanders, he adds. Gaining access to installations will continue much the same as well, but who secures the entrances might adjust based on which service branch has the lead for a specific base.